Lisa Hogarty, most recently chief operating officer of the Columbia University Medical Center and previously Columbia’s executive vice president for student and administrative services, has been appointed Harvard’s vice president of campus services. 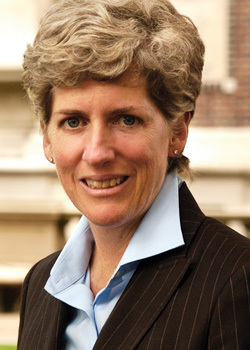 Executive vice president Katie Lapp, who made the announcement in late April, cited Hogarty’s management experience in both academia and healthcare. She will oversee the 1,600 employees in dining services, real estate, and the University operations center (including environmental health and safety and incident-support teams). Among 72 members newly elected to the National Academy of Sciences in April, nine are Harvard faculty affiliates: Porter W. Anderson, senior lecturer on pediatrics, Harvard Medical School; Michael J. Hopkins, professor of mathematics; William G. Kaelin, professor of medicine; Gary King, Weatherhead University Professor, a quantitative social scientist; Kenneth S. Rogoff, Cabot professor of public policy (see "After Our Bubble," page 38; Donald B. Rubin, Loeb professor of statistics; Kevin Struhl, Gaiser professor of biological chemistry and molecular pharmacology; Mary C. Waters, Zuckerman professor of sociology; and David A. Weitz, Mallinckrodt professor of physics and applied physics. Five members of the Faculty of Arts and Sciences have been awarded Harvard College Professorships, FAS’s highest recognition for exceptional undergraduate teaching, advising, and mentoring. The five-year appointments come with a semester of paid leave or summer salary, and additional support for research. This year’s honorands are Michael Brenner, Glover professor of applied mathematics and applied physics; Julie Buckler, professor of Slavic languages and literatures; Emma Dench, professor of the classics and of history (see Harvard Portrait, March-April, page 49); Peter Gordon, professor of history; and Daniel Lieberman, professor of human evolutionary biology (see “‘Dissing’ Evolution,” May-June 2009, page 13).